Patricia Mitchell and ‘Sparky, the Fire Dog’ explain this year’s campaign “Look. Listen. Learn. Be aware. Fire can happen anywhere.” to students at the Garmisch school. GARMISCH-PARTENKIRCHEN, Germany — The Great Chicago Fire, which began on Oct. 8, 1871, devastated the city, killed more than 250 people, left 100,000 homeless, destroyed more than 17,400 structures and burned more than 2,000 acres of land. In commemoration, Fire Prevention Week is observed each year during the week of Oct. 9. This year’s Fire Prevention Week had a great surprise in store for the children and students of the U.S. Army Garrison Bavaria – Garmisch Community. Garmisch Fire Chief Wolfgang Pauls-Polch conducted a fire drill at Garmisch Elementary and Middle School with a little help from an actual Sparky, the Fire Dog. Sparky, an 8-year-old Dalmatian and his human, Patricia Mitchell, joined the Garmisch Community from USAG Yongsan, South Korea, in February. Sparky and Mitchell explained this year’s campaign motto to students in grades 3-8: “Look. Listen. Learn. Be aware. 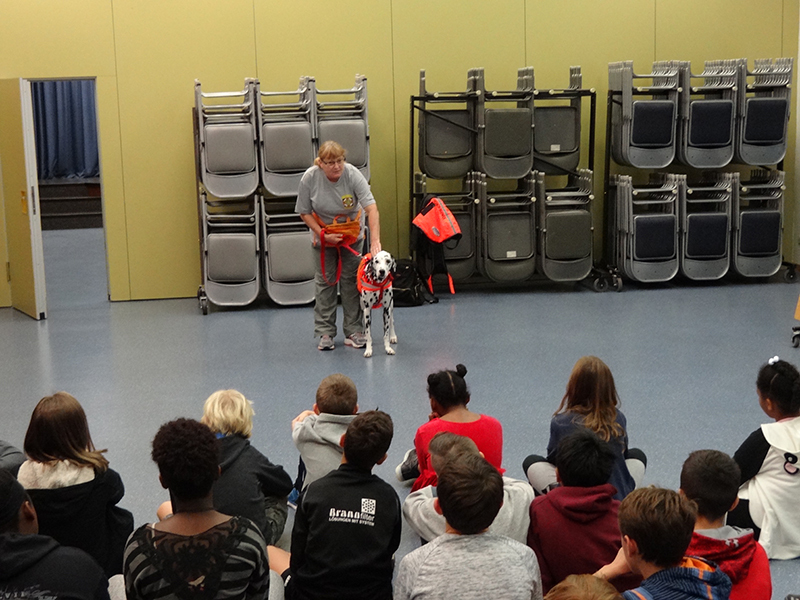 Fire can happen anywhere.” The children met Sparky in the assembly room after they gathered outside the building when the fire alarms went off. Host Nation fire fighter Benni prepares the fire hose for demonstrations. First and second grade students were met by Freiwillige Feurwehr (volunteer fire department) Garmisch- Partenkirchen firefighter “Benni.” The students practiced how to hold a charged firehose and felt the powerful resistance as the water coursed through it. Following the demonstration, they enjoyed a ride in the firetruck through the housing area complete with sirens and flashing blue lights. 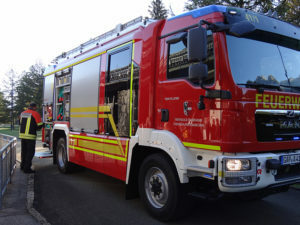 Since the Garmisch Community doesn’t have its own fire department, the German-American cooperation with the Garmisch-Partenkirchen department is critical. Pauls-Polch has maintained a close working relationship since he joined the Garmisch team in 2005. ‘We receive great support from the host nation fire departments, from both Garmisch and Partenkirchen, whenever the need arises. And we are very lucky to have such great relationships with all emergency responders in the greater Garmisch area,” Pauls-Polch said. Throughout the year, Pauls-Polch requests support from the GAP Feurwehr not only for emergencies, but also for help with community events, such as the annual tree lighting ceremony when Santa arrives via firetruck. Fire safety education isn’t just for school children. Teenagers, adults and the elderly are also at risk in fires, making it important for every member of the community to take some time every October during Fire Prevention Week to make sure they understand how to stay safe in case of a fire. To remind all residents of the importance of Fire Prevention Week, Pauls-Polch left a ‘goodie bag’ with fire safety information at every door in the housing area. “Remember to review your fire safety plans more often than just during Fire Prevention Week every October,” Pauls-Polch said.